Bushido (武士道 Bushidō), meaning "way of the warrior," is a Japanese code of conduct and a way of life, associated with the Samurai, and loosely analogous to the Western concept of chivalry. It is also known as the Samurai code and was influenced by the teachings of Zen Buddhism as well as Confucianism. Historically, Bushido developed between the eleventh to fourteenth centuries in Japan and spread through the warrior class. Inazo Nitobe (1862-1933), in his book, Bushido: The Soul of Japan, described it in this way: "Bushido, then, is the code of moral principles which the samurai were required or instructed to observe… More frequently it is a code unuttered and unwritten… It was an organic growth of decades and centuries of military career." Eventually, the tenets of Bushido were written down in numerous documents dating from the twelfth to sixteenth centuries. Under the Tokugawa Shogunate, Bushido became formalized into Japanese Feudal Law. The core tenets of Bushido are honor, loyalty, courage, rectitude, calmness, justice, fairness, and politeness. These virtues have had an enduring influence on Japanese history, culture, and values into the modern period. Thus while the Bushido code sometimes led to extremes—such as ritual suicide (seppuku) and loyalty even to despotic rulers, overall it played an important role in the dissemination of moral virtue and the moral edification of Japanese society. Some notable modern Japanese Christians, such as Kanzo Uchimura (1861-1930) and Inazo Nitobe, appreciated the virtuous tradition of Bushido as an important foundation for their Japanese Christianity, which they referred to as "Christianity grafted onto Bushido." Yet, Christianity with its ethic of forgiveness and compassion towards one's enemy never took hold in Japan. Lacking these moderating qualities, Bushido may have led Japan to militarism and to Japan's abhorrent treatment of prisoners of war during World War II. There is evidence to suggest that the ideas of Bushido have existed in the Japanese literature from the earliest recorded literary period in the history of Japan. Kojiki is Japan's oldest extant book. Written in 712 C.E., it contains passages about Yamato Takeru, the son of the Emperor Keiko. It provides an early indication of the values and literary self-image of the bushido ideal, including references to the use and admiration of the sword by Japanese warriors. Yamato Takeru may be considered the rough ideal of the Japanese warrior to come. He is sincere and loyal, slicing up his father's enemies "like melons," unbending and yet not unfeeling, as can be seen in his laments for lost wives and homeland, and in his willingness to combat the enemy alone. Most important, his portrayal in the Kojiki shows the ideal of harmonizing the literary with the martial may have been an early trait of Japanese civilization, appealing to the Japanese long before its introduction from Confucian China. This early conceptualization of a Japanese self-image of the "ideal warrior" can further be found in Shoku Nihongi, an early history of Japan written in the year 797 C.E. A section of the book covering the year 723 C.E. 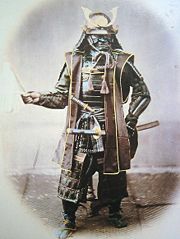 is notable for an early use of the term bushi in Japanese literature as a reference to the educated warrior-poet ideal. The term bushi entered the Japanese vocabulary with the general introduction of Chinese literature and added to the indigenous words, tsuwamono and mononofu. In Kokinshu (early tenth century), the first imperial anthology of poems, there is an early reference to Saburau—originally a verb meaning "to wait upon or accompany a person in the upper ranks of society." In Japanese, the pronunciation would become saburai. By the end of the twelfth century, samurai became synonymous with bushi almost entirely and the word was closely associated with the middle and upper echelons of the warrior class. From the Bushido literature of the thirteenth to sixteenth centuries, there exists an abundance of literary references to the ideals of Bushido. Written in 1371, the Heike Monogatari chronicles the struggle between the Minamoto and Taira clans for control of Japan at the end of the twelfth century—a conflict known as the Gempei War. Clearly depicted throughout the Heike Monogatari is the ideal of the cultivated warrior. The warriors in the Heike Monogatari served as models for the educated warriors of later generations, and the ideals depicted by them were not assumed to be beyond reach. Rather, these ideals were vigorously pursued in the upper echelons of warrior society and recommended as the proper form of the Japanese man of arms. Throughout this literature, important themes and values in the Bushido code were developed. For example, Bushi (warriors) were expected to conduct themselves with calmness, fairness, justice, and politeness. They were also expected to be fiercely loyalty to one's master, to preserve the honor of their name and reputation, and to find a proper death in battle. Bushido was widely practiced and it is surprising how uniform the samurai code remained over time, crossing over all geographic and socio-economic backgrounds of the samurai. The samurai represented a wide populace numbering between 7 to 10 percent of the Japanese population, and the first Meiji era census at the end of the nineteenth century counted 1,282,000 members of the "high samurais," allowed to ride a horse, and 492,000 members of the "low samurai," allowed to wear two swords but not to ride a horse, in a country of about 25 million. Bushido expanded and formalized the earlier code of the samurai, and stressed frugality, loyalty, mastery of martial arts, and honor to the death. Under the Bushido ideal, if a samurai failed to uphold his honor he could regain it by performing seppuku (ritual suicide). Seppuku is a more correct expression for an act of suicide performed by the process of cutting open the abdomen. Seppuku is better known in the West as hara kiri (belly-cutting), and is a concept so alien to the European tradition that it is one of the few words from the world of the samurai to have entered foreign languages without a need for translation. Seppuku was commonly performed using a dagger. It could take place with preparation and ritual in the privacy of one’s home, or speedily in a quiet corner of a battlefield while one’s comrades kept the enemy at bay. Bushido made constant awareness and preparation for death a important tenet of their philosophy. One might say that the overall purpose of Bushido was to die a good death and with one's honor intact. Some people in Japan as well as other countries follow the same virtues listed above under the philosophical term modern bushido. The idea was derived from the fact that the Japanese male should be able to adapt his beliefs and philosophies to a changing world. The warrior protects and defends because he realizes the value of others. He knows that they are essential to society and, in his gift of service, recognizes and values theirs… take the extra moment in dark parking lots at night to make sure that a woman gets into her car safely before leaving yourself. Daily involvement in acts such as these are as much a part of training as time spent in the dojo, and indeed should be the reason for that time spent training… When faced with a woman or child in a situation in which they are vulnerable, there are two types of men: Those who would offer succor and aid, and those who would prey upon them. And in modern society, there is another loathsome breed who would totally ignore their plight! Born as sons of their samurai parents at the end of Tokugawa feudal era, modern Japanese Christians such as Kanzo Uchimura and Inazo Nitobe appreciated the virtuous tradition of Bushido as an "Old Covenant," a preparation for Christianity the "New Covenant," referring to their Japanese Christianity as "Christianity grafted onto Bushido." In the words of Uchimura, "Bushido is the finest product of Japan. But Bushido by itself cannot save Japan. Christianity grafted onto Bushido will be the finest product of the world. It will save not only Japan, but the whole world." Most Japanese people, however, never became Christians. Lacking the Christian elements of compassion and forgiveness, Bushido remained a stern and sometimes harsh doctrine. While Bushido definitely helped to establish loyalty as a common virtue of Japanese people, it may also have led Japan to become a militaristic nation in the 20th century. Critics attribute the Japanese military's abhorrent record of mistreating American and British POWs during World War II to Bushido, which deems surrender as dishonorable. ↑ Inazo Nitobe, Bushido, the Soul of Japan. Retrieved November 20, 2007. ↑ Mikiso Hane, Japan: A Historical Survey (New York: Charles Scribner's Sons, 1972). ↑ History News Network, Mistreatment of POW's an Old Story. Retrieved November 20, 2007. Freeman-Mitford, Algernon Bertram. The Tale of Forty Seven Ronins. Jiujiya, 1892. Freeman-Mitford, Algernon Bertram. Tales of Old Japan. 1871. This page was last modified on 21 December 2016, at 22:54.